Do you ever look at foods and wonder what else they could be? I do it all the time. That’s how I come up with recipes like Vegan “Pulled Pork” Sandwiches, Vegan Pepperoni, Eggplant Queso, and Quinoa Brittle. I think it’s limiting to think of foods as only being enjoyed one way. Such is the case with watermelon. Think big, people. It isn’t just meant to be cubed and enjoyed at BBQs (although, absolutely delicious). What if you turned it into “sashimi”? Just looking at watermelon it has the same hue as tuna or salmon. Kind of weird, right? The texture may be different, but its color and flavor lend to a fun application of sashimi. This plant-based version is oh-so much fun. Plus, it only requires 7 ingredients and 10 minutes! 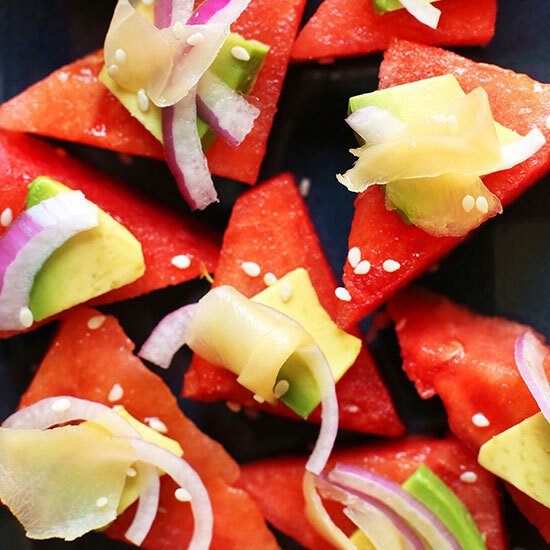 Simply slice watermelon into triangles, wick away some of the moisture, and brush with a sesame-tamari glaze. A little wasabi adds a kick, which I thoroughly enjoy with sushi. Toppings can be modified to what sounds best to you, but to keep things simple I went with avocado, red onion and pickled ginger. A few sesame seeds (black or white) add a nice pop of color and tiny crunch. This makes the perfect summer afternoon or pre-dinner snack. In fact, if I had friends over for Portobello Stir-Fry, Peanut Butter Tofu Stir-Fry, or Brown Rice Sushi, I might just serve this as an appetizer. My friends are going to be so confused (and so happy) about this. If you try this recipe, let us know! Leave a comment, rate it, and don’t forget to tag a picture #minimalistbaker on Instagram. We’d love to see what you come up with. Cheers, friends! 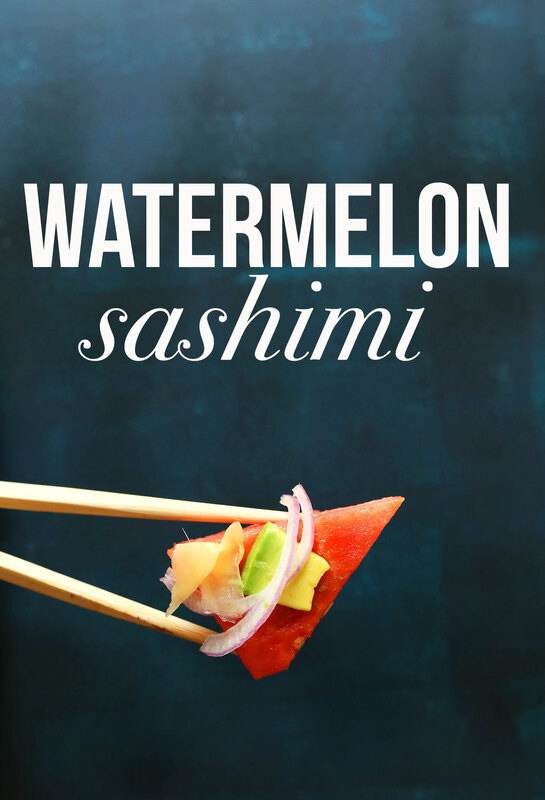 Simple, refreshing, flavorful watermelon sashimi in 10 minutes! 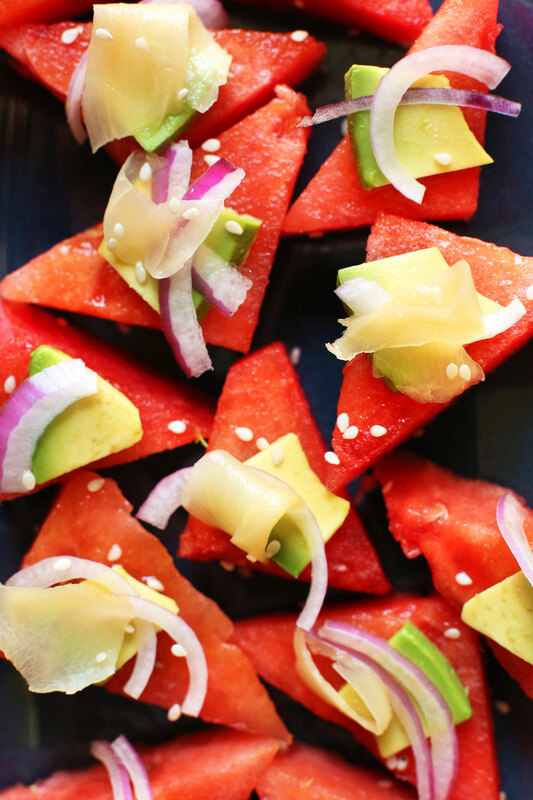 Ripe watermelon brushed with a sesame-tamari glaze, topped with avocado, onion, pickled ginger, and sesame seeds! 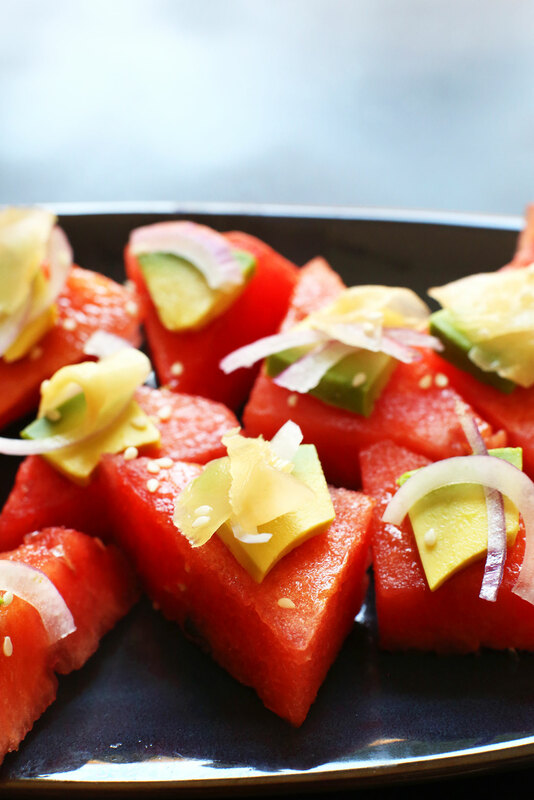 A simple, summer-friendly appetizer or side. 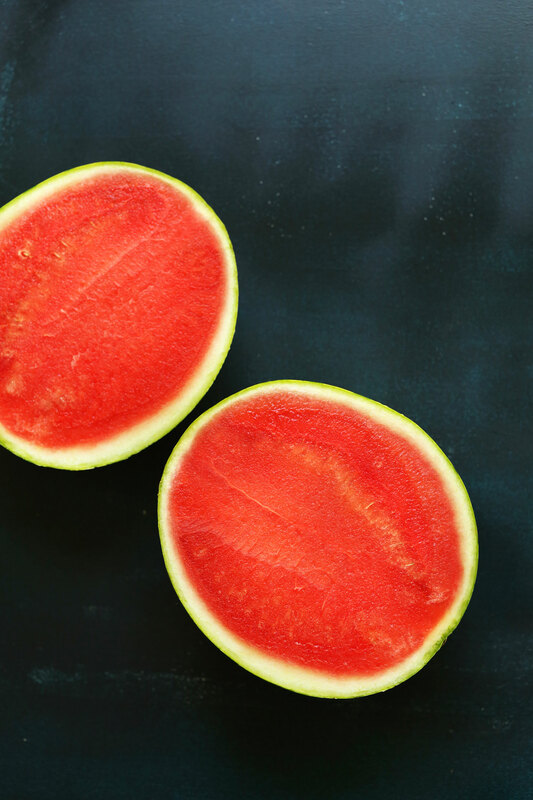 Cut watermelon into bite-sized triangles and set on a paper towel or clean towel to draw out some of the moisture. In the meantime, whisk together the glaze ingredients. Set aside. 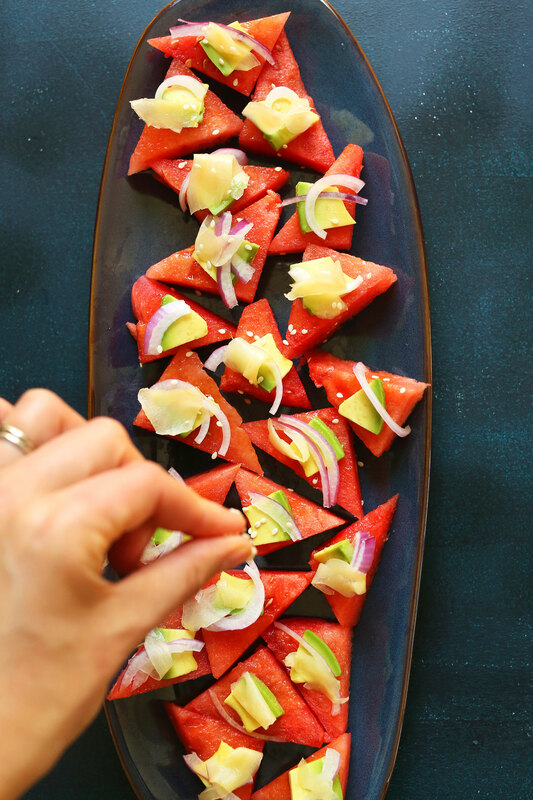 To assemble, transfer watermelon to serving plate(s) and brush the tops with the glaze. 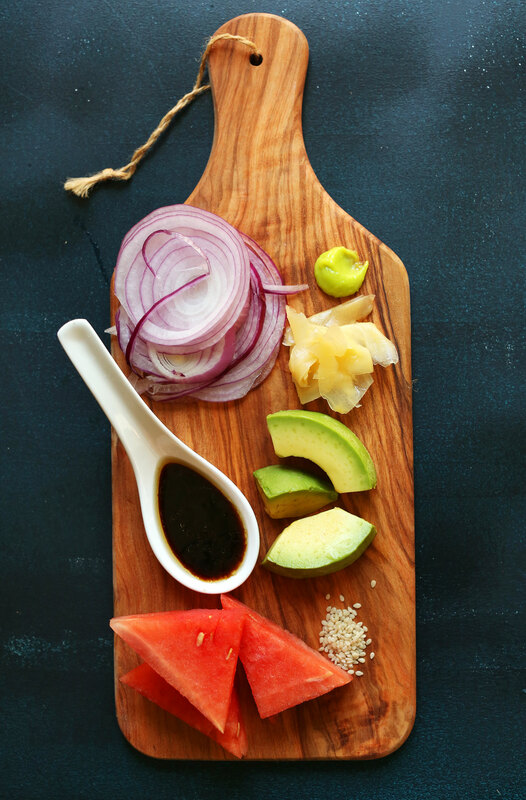 Then top with avocado, red onion, pickled ginger, and sesame seeds. Enjoy immediately! Best when fresh, though can be refrigerated up to 24 hours in advance. We made this tonight and loved it SO much! I made this as an appetizer for my mother, grandmother, and sisters for Mother’s Day yesterday (followed by fresh summer rolls and Alicia Silverstone’s edamame potato salad). This was such a fun and light dish! We all agreed that this is a new summery family favorite. Thank you! Ah missed a trick here. Marinate in a little oil and soy, then roast in the oven. All graininess disappears, the corners go nicely caramelised, comes out with the texture and look of seared ahi tuna. Wait until cooked then add your toppings and serve on some sushi rice. So creative! I’m not a huge watermelon fan and I would try these. But this looks awesome too (and a lot less time consuming)! Wow, I’ve never heard of anything like that, such an incredible idea! I always add watermelon to my sushi since its color mocks salmon and its sweetness pairs well with wasabi. A recipe for watermelon poke would be interesting, considering it consisted one of my favorite flavor combinations! I love this idea! My mouth is literally watering right now. I am so excited to make this! How creative, I love how you think outside the watermelon box! My kids will devour these…if I don’t eat them all myself first. Thanks for always sharing the best recipes around. Wow now I’m craving watermelon. Looks yummy. Maybe try some fresh cilantro on it. I love your idea — so beautiful, and it sounds refreshing and satisfying. Dana, where do you put the wasabi? On the side, or would you put a little drop on top of the ginger?? These look great!! How creative!! I’ve seen this done with a vacuum sealer and always wrote it off as I don’t cook in the Chopped kitchen. You, Dana, have convinced me to try it anyway!! You nailed it! I am making it! Thanks so much – love your creative ideas! VERY interesting take on sashimi, haha! This is perfect for any raw vegan party or fruitarian picnic! I bet avocado tastes really nice with the watermelon! what a genius idea! such a healthy, great looking, affordable, think-outside-the-box appetizer or snack. love your creativity and your recipes!